We were fair delighted this week to hear that Miki Bratanić’s konoba has received the status of a protected cultural heritage site. The building and its contents have been recognised as a fine example of the traditional Dalmatian konoba. 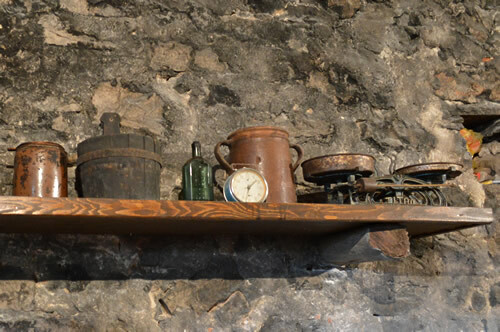 It’s a great tribute to the care and preservation of the old building and equipment, much of which dates from the 19th century and has been continuously in use since then! See our previous article about Miki and his konoba here. Miki Bratanić’s konoba is now a protected cultural heritage site! The konoba of the Bratanić family is in the Krojevi dvori area of the village of Vrbanj, where there’s a mix of old stone houses and businesses. It’s typical of the traditional village architecture in the central part of the island. The original stone house has been extended by the Bratanić family in keeping with the original style and with minimal intrusion of modern materials. Coming in from the rather steep lane there’s a courtyard enclosed by a high stone wall, and on the ground floor of the house is the konoba while the first floor is for living. As the building is on a slope, you enter the konoba down some stone steps. 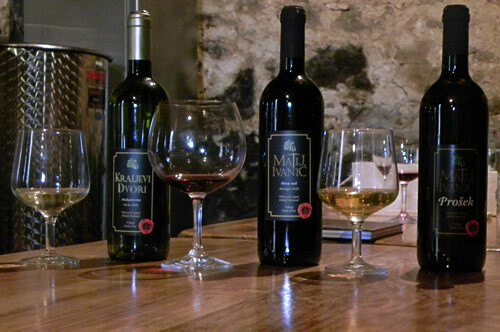 The protected cultural items relate to viticulture and wine production that has been at the heart of Dalmatia’s economy for millennia, particularly here on Hvar. 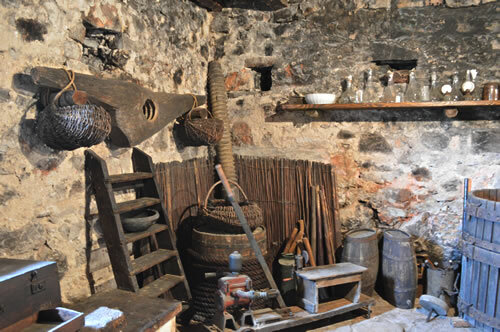 From them, you can trace changes over time in wine production and storage, with different types of presses and barrels. 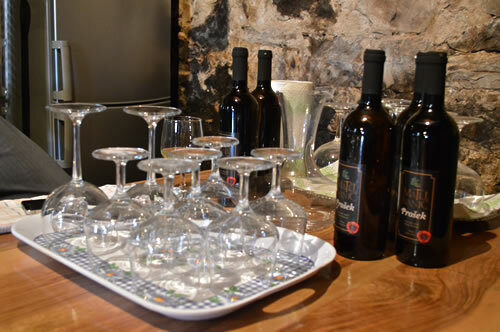 And it’s not just about the wine – there are stone jars for oil, and a selection of tools needed for work in the vineyards and olive groves, glass and wooden vessels for wine, rakija and prošek, as well as equipment for draft animals. Most of the items are apparently still in use, though I don’t think they still have a donkey! The word konoba derives from the latin canaba, meaning a hovel, hut or shed. In the plural, canabae, it meant a settlement outside a Roman military camp of traders or discharged soldiers. The same word canaba has given us the word cabin, cabano in Spanish, cabina in Italian. Not to be confused with the latin word cannabum, meaning hemp, which they took from the Greek word cannabis! Konoba is a particularly southern Croatian tradition. You might think of it as a cellar, and indeed it has some similarities. In the north, they would translate cellar as podrum. But a Croatian waiter, the person who brings you your food in a restaurant, is known as a konobar. Why is that? Why not a podrumar? There’s a very entertaining article by Pavao Pavličić on just that topic – what is the essential difference between a konoba and a podrum? I’ll summarize his explanation in English for you, and if you can, do read the original Croatian on the Matica website, there’s a link below. Basically it comes down to the number of glasses! A podrum is usually underground, entered by at least two or three steps. In the north, it’s relatively easy to dig out an underground room as you’re building your house. But in the south, houses were generally built on rock, so the konoba tends to be on ground level. Unless, of course the ground is on a slope, as in the case of the Bratanić’s konoba, which may also qualify as a podrum by this criterion! A konoba is always pretty much the same, while a podrum comes in different types. A wine podrum contains barrels but is otherwise kept clear, others may hold any one of groceries, firewood or old junk. By contrast, a konoba is never used for hoarding old stuff, much less for storing wood. 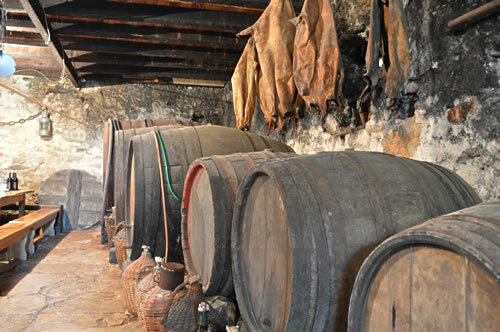 As a wine cellar, however, it is dominated by barrels and whatever else is needed for the production of wine. 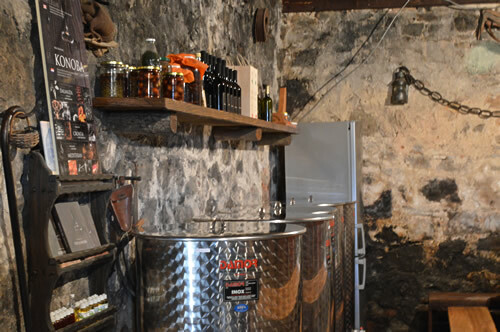 But there are also other vessels besides wine tanks and other liquids besides wine – such as vinegar, rakija and prošek. And other produce: potatoes, onions, figs and tomatoes, almonds and carob. In addition, the konoba has aspects of a workshop for repairing barrels, or also shutters or the rudder of a ship. And it has a table on which to put food and drink, and entertain your friends. The konoba is a much more social place than a podrum, where people only go to work or take things out of store. 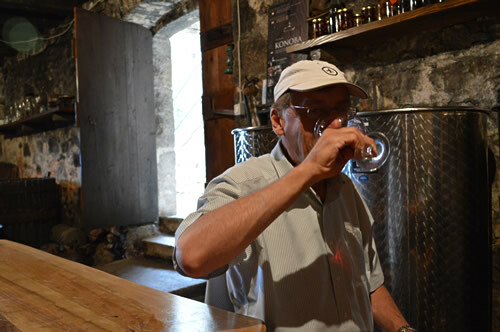 But when the owner of a konoba is finished work, he’ll sit down to drink a glass of wine or rakija and take it easy. Friends will know to come by when the konoba door is open. Because of that, a konoba can be easily transformed into a bar or restaurant. Wine would be sold straight from the barrel, and the buyer can drink it right there. As business develops, if you employ some help to serve the customers, who would that be but a konobar! 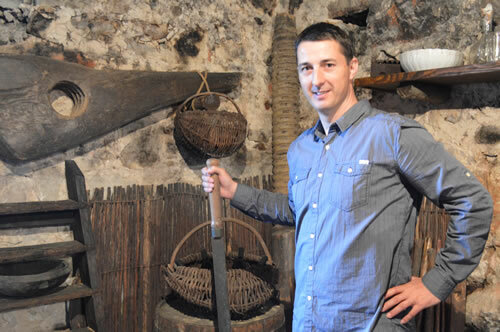 So there you are, for the certified authentic konoba experience, visit the Bratanić family konoba in Vrbanj. Good company, and the wine and the prošek are excellent!